Foxhole Technology Awarded Security Information Event Manager (SIEM) Support Services — Foxhole Technology, Inc.
Foxhole Technology won its recompete for Security Information Event Manager (SIEM) Support Services for the Defense Information Systems Agency (DISA)/ Development and Business Center (DBC). Awarded on the DISA Blanket Purchase Agreement (BPA), HC1028-17-A-0010, the period of performance encompasses option years through April 30, 2022. Building on our current success on the Security Information Manager (SIM) program, Foxhole Technology will continue to meet the ever increasing demands for higher confidence and near real-time detection of security incidents by improving the SIEM technology. The next generation SIEM will provide scalable, detective, investigative and analytic capabilities and workflows to enable more effective and efficient incident response. Foxhole Technology will build upon and/or replace current capabilities to achieve a unified federated approach for collection, analysis, visualization and information sharing that will become the primary alerting and workflow platform across DISA and the United States Cyber Command (USCYBERCOM). Task Area 1 –Order Management. Provide management controls and support for organizational resources to meet the performance and schedule requirements during order execution. Task Area 2 – Software Design. Provide Authorization and Accreditation (A&A) support for the SIEM baseline(s). Task Area 3 – Software Development Support. 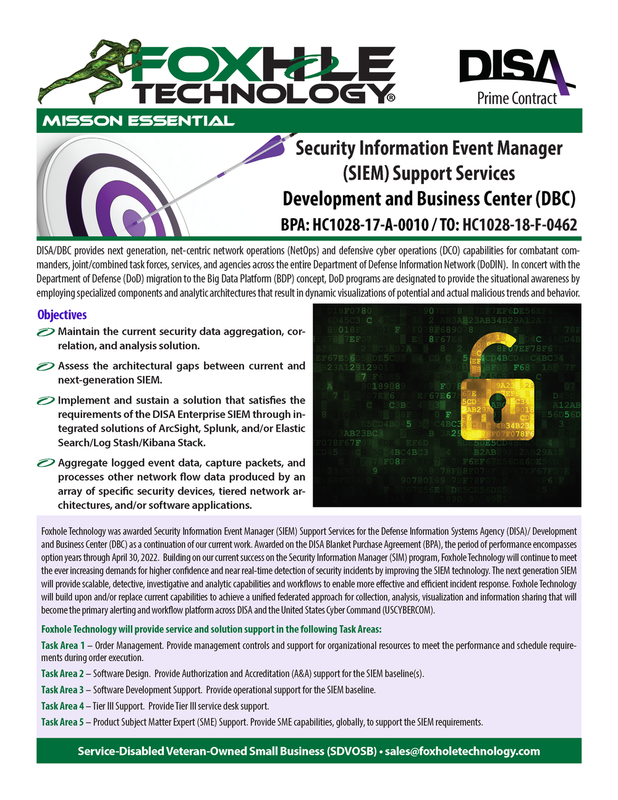 Provide operational support for the SIEM baseline. Task Area 4 – Tier III Support. Provide Tier III service desk support. Task Area 5 – Product Subject Matter Expert (SME) Support. Provide SMEs, globally, as outlined in the place of performance, to support the SIEM requirements. DISA/DBC provides next generation, net-centric network operations (NetOps) and defensive cyber operations (DCO) capabilities for combatant commanders, joint/combined task forces, services, and agencies across the entire Department of Defense Information Network (DoDIN). In concert with the Department of Defense (DoD) migration to the Big Data Platform (BDP) concept, DoD programs are designated to provide the situational awareness by employing specialized components and analytic architectures that result in dynamic visualizations of potential and actual malicious trends and behavior. For more information please contact Mark Cosgrove.